Consider an image-map-based quick navigator. Add a scroll bar for the log display. Fix the "handout only" key to show the highest available resolution. Implement "copyToClipboard" for views and log also for firefox and chrome. (Probably not worth the bother). Fix the Pg-Dn selected-select-box bug. LesDiablerets-1708 HandoutBrowser.js Dogma.html Compatibility with Logitech remote. Cornell-150925 HandoutBrowser.js K34.html Minor bug fixes. Vienna-1402 HandoutBrowser.js BF2C.html Better logging. AKT-14 HandoutBrowser.js FridayIntro.html Major bug fix - mouse tracking failed on new IEs. Bern-131104 HandoutBrowser.js KVT.html Minor bug fixes, clickable zoom buttons. Geneva-131024 HandoutBrowser.js KBHFT.html Minor bug fixes. CUMC-1307 HandoutBrowser.js Vis4D.html Added support for image maps - hyperlinks from within a handout. Chicago-1303 HandoutBrowser.js twbh.html Added "duplicate" key for "views". Cambridge-1301 HandoutBrowser.js NCGE.html Improved "refresh" hint. Hamburg-1208 HandoutBrowser.js bh.html Added "refresh" hint. Binghamton-1203 HandoutBrowser.js beta.html Allowing "backwards" capture rectangle. GWU-1203 HandoutBrowser.js beta.html Bug fix. Colombia-1107 HandoutBrowser.js Stonehenge.html Minor tweaks. Tennessee-1103 HandoutBrowser.js CC.html Minor bug fix. Toronto-110110 HandoutBrowser.js GT.html Minor provision for interaction with dbnvp added. Chicago-1009 HandoutBrowser.js axpb.html, 18C.html "Copy to clipboard" of views and log implemented, but only for explorer. Montpellier-1006 HandoutBrowser.js m1.html Another logging bug fixed. Luminy-1004 HandoutBrowser.js 18C.html Minor bugs fixed (one by Scott Morrison), resized log display. Fields-0911 HandoutBrowser.js Hilbert13th.html Log entry skipped if ..
Bonn-0908 HandoutBrowser.js KV.html Minor tweak and bug fix. HUJI-090727 HandoutBrowser.js KV.html Persistent logging (using cookies). Mathcamp-0907 HandoutBrowser.js hardest.html, NCGE.html Added "talk timer", work on logging. Paris-0906 HandoutBrowser.js KV.html Bug fixed. Trieste-0905 HandoutBrowser.js KV.html, TheGrandScheme.html, Day4.html Bug fixed, default for "views". KSU-090407 HandoutBrowser.js hardest.html Settable "glide_mode", hyperbolic gliding, minor tweaks. A bit buggy. PSU-090205 HandoutBrowser.js 3x4.html Easier setup, "next view". Oberwolfach-0805 HandoutBrowser.js Ober.html Lower resolution while gliding, minor touches. UofT-GS-071023 HandoutBrowser.js NCGE.html Double buffering following Morrison's spiders talk, support for multiple slide resolutions, minor touches. Fields-0709 HandoutBrowser.js VeryPlanar.html Pull down goto menu, 4 text levels. Hanoi-0708 HandoutBrowser.js FollowingLin.html Mouse dragging, capture rectangle. Tianjin-0707 HandoutBrowser.js FollowingLin.html First working version. Largely, this project is undocumented other than the hints that appear in the browser window itself. The exception is what I had to write down in order not to forget it myself. The key "b" swaps the text mode and turns on logging, if it was off. The key "l" displays the current log and suspends logging. The key "v" clears the current log and suspends logging. The timer is shown (unless textmode is 0) iff logging is on. If a view titled "----" exists within the views defined for a handout, the view before it is considered as the last "ordinary view" for that handout, and the views below it become image-map hyperlinks, which glide with the handout, whose titles are their targets. An example is at Vis4D.html. When the corresponding regions of the handout are clicked, the target URL opens in an 800x600 popup window. To start creating hyperlinks, hit "c" and capture a view (whose precise coordinates will be ignored). Rename it to "----", and move it to the bottom of the list of views using "a" repeatedly. To create a new hyperlink, capture a new view in the ordinary way (hit "c"), rename it using "r" and put the desired URL as its name/title, and then push it to below the "----" by repeatedly hitting "a". Prezi came later, and may be more user friendly. I didn't look at it seriously yet. The HandoutBrowser.js project is not about math, but about displaying math (or other things, just as well). Yet some truly lovely math found its way in, and I once wrote a short note explaining it, or rather, posing it. That note also explains, even if briefly, why I bother with the HandoutBrowser.js project. Here it is. The problem I'm about to describe came from a completely practical place. For reasons of ideology and convenience, often I give my talks out of a single-page densely printed handout that contains all major formulas and pictures I use in my talk. One page is what fits in one hour, and any member of my audience can read ahead and back and is not forced to follow my exact pace as would be the case in a PowerPoint presentation (and is not bumped off the moment her internal pace slightly deviates from mine). Question. Assume the Earth is flat. 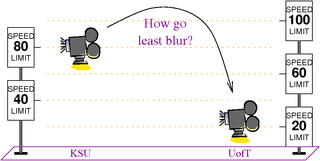 We want to fly a virtual video camera from a kilometer above the Kansas State campus (so that the whole thing is in sight) to a kilometer above the University of Toronto campus (so that the whole thing is in sight) in 10 seconds or less, so that the resulting movie will have the least blur. Clearly, we shouldn't fly at a constant elevation, for a camera moving so fast so close to the ground will suffer immense motion blur. Instead, we should fly up and thus zoom out, then move sideways fast but while we're far, and then zoom back in again. But what's the precise optimal path? And what should our speed be at any point along that path? You should figure out the solution yourself, or read about it here (hit "n" a number of times to move around the handout), or watch a video explaining it here. Whichever you do, I'm very proud of this problem - it is the hardest practical math problem I ever had to deal with personally and the solution is a beautiful introduction to some wonderful mathematics. This page was last modified on 31 August 2017, at 02:38. This page has been accessed 115,592 times.